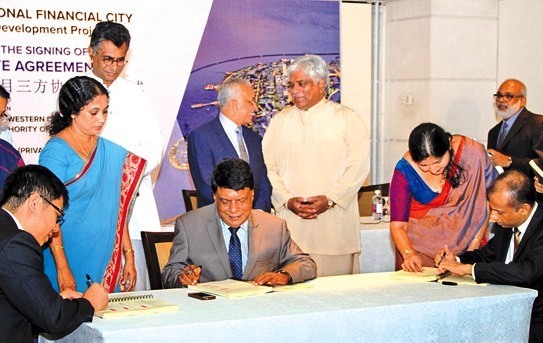 The Ministry of Megapolis and Western Development, the Urban Development Authority (UDA) and CHEC Port City Colombo (Pvt) Ltd. today signed an agreement to establish a financial city in Colombo. The agreement formally replaces the agreement signed by the previous government on September 16, 2014. The Cabinet, on Wednesday, approved the proposal by Prime Minister Ranil Wickremesinghe, in his capacity as Minister of National Policies and Economic Affairs, to draft the required legislation to establish the financial city in Colombo. It said the objective of the proposed financial city is to make Colombo a financial hub, to attract foreign investments from South Asian and Middle East regions, as well as from European countries.